The National Center for Environmental Health (NCEH) and the Agency for Toxic Substances and Disease Registry (ATSDR) have honored A Story of Health multimedia eBook/continuing education course with an “Excellence in Communications” award. NCEH and ATSDR are agencies of the Centers for Disease Control and Prevention (CDC). 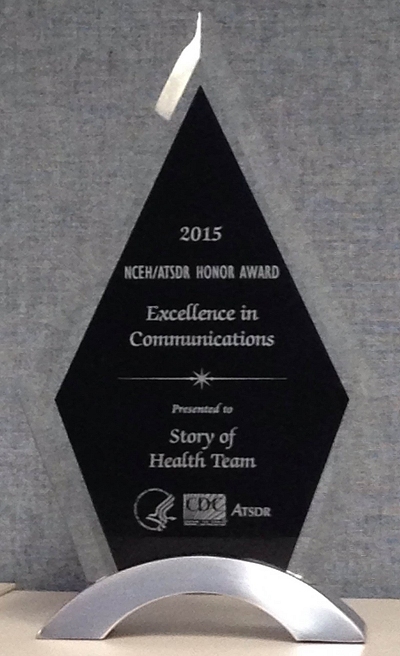 The award was given at the annual NCEH/ATSDR Honor Awards on February 3, 2016, to A Story of Health Team for excellence in communication for the development of a medical education product that highlights the importance of environmental health. We all know there are multiple contributors to health and disease, but let’s say you want to figure out what the latest science says on environmental links to, say, asthma? Or learning disabilities? Or childhood leukemia? Pretty daunting, isn’t it? Which websites have the most evidence-based science? Which articles are accessible without paying a subscription or membership fee? What do those research findings mean for your patients, your family, and community? And many other pressing questions. Most health care professionals can’t begin to keep up with the emerging scientific literature, much less the rest of us. Fortunately, A Story of Health is a brilliant, innovative new resource that can help you find out how various environments interact with our genes to influence health across the lifespan. Based on the latest peer-reviewed research, it’s more than a bunch of scientific facts thrown together with fancy graphics. It’s a story, or really—multiple, interactive, and interconnected stories that touch us and teach us not only about risk factors for disease, but how to prevent disease and promote health and resilience. Asthma is a complex disorder made up of different subtypes with differing causes, underlying pathology, treatment responses, and natural histories. According to the Centers for Disease Control, about 1 in 12 people in the US have asthma, and the numbers are growing every year. The disorder costs over $56 billion in medical costs, lost school and work days, and early deaths annually. In 2005, CHE’s Asthma and the Environment Working Group convened a series of conversations to explore our interests in this complex disease and to see if we could identify some aspect of asthma around which we could focus our efforts. We began to wonder about the allocation of asthma research dollars. How much is invested in understanding the origins of asthma and opportunities for primary prevention versus how to reduce the frequency and severity of asthmatic episodes in people who already have the disease? With that question in mind, we reviewed the research portfolio of the National Heart, Lung, and Blood Institute (NHLBI) at the National Institutes of Health and concluded that less than 10 percent of asthma-related research was devoted to understanding the causes and primary prevention of the disease. Even though this was a rough estimate, based on a review of project descriptions in the NIH database, it seemed to indicate that primary prevention of asthma was underfunded. Following that review, the working group concluded that convening a workshop to address the causes and primary prevention of asthma would be worthwhile. Published proceedings might attract more funding and help to raise awareness of the urgent need. However, we were initially unable to secure support for the proposed undertaking and the idea languished. In 2009, CHE partner Polly Hoppin, Research Professor and Program Director of the environmental health program at the Lowell Center for Sustainable Production at the University of Massachusetts, Lowell, seized an opportunity to incorporate the primary prevention of asthma into the first Strategic Plan for Asthma in Massachusetts. Polly worked with partner organizations in the Massachusetts Asthma Advocacy Partnership to draft a goal in the plan to “develop a Roadmap for better understanding the causes of asthma and the role of primary prevention in Massachusetts.” Its objective was to “develop agreement—’a roadmap’—among experts and other groups on the current evidence on primary prevention, research needed to increase our understanding of prevention of asthma, and evidenced-based strategies that can be currently implemented in Massachusetts.” With the goal of primary prevention of asthma clearly spelled out in the state’s strategic plan, Polly and her colleagues successfully undertook new efforts to find resources to convene a meeting addressing the state of the science, research needs, and capacity to reduce new onset asthma over time. Polly and Molly Jacobs from UMass Lowell organized and led a planning committee that put considerable effort into preparing for the conference, “The Primary Prevention of Asthma: A Symposium on Current Evidence, Research Needs, and Opportunities for Action”, held at the Massachusetts Medical Society in Waltham, Massachusetts, in April, 2013. See http://www.sustainableproduction.org/proj.envh.AsthmaSymp.php for a description, the agenda, and links to presentations. Participants included invited researchers, clinicians, labor and community representatives, public health professionals, and government leaders from a range of sectors, including housing, education, health, transportation and environment. The symposium was co-sponsored by the Massachusetts Department of Public Health, the National Institute for Environmental Health Sciences, the US Department of Health & Human Services, Region I (New England), the Boston Public Health Commission, the American Lung Association of the Northeast, and Neighborhood Health Plan, with in-kind support from a range of collaborating organizations. Opening presentations helped to frame the multifactorial, multilevel complexity of asthma, its public health impacts, and the structural and cultural underpinnings of asthma disparities. They were followed by experts who had been asked to review the state of the science linking specific risk factors to asthma onset, for example obesity, air pollution (in particular, traffic proximity), indoor allergens (i.e. dust mites and mold), dietary factors, chemicals, and stress, among others. These experts provided a summary of the literature, their analysis, and concluded with a recommended classification of each risk factor under discussion as known, probably, possibly, or known not to be associated with asthma onset. As necessary, risk factors were considered unclassifiable when data were inconsistent or sparse. Following presentations of the evidence, conference attendees broke out into subgroups to discuss the various risk factors and decide which were “ready for action” based on the state of the science and considering additional factors such as: (a) the magnitude of the potential public health impact given the strength of the association and/or the scale of potential exposure, (b) additional benefits that could be reasonably expected to come with taking action, (c) the likelihood that taking action would result in serious unintended consequences. For those interested in more detail about the risk factors and conclusions reached at the conference see the conference link (above) and a CHE partner call summarizing the symposium. At the conclusion of the symposium attendees concurred that the primary prevention of asthma will require multiple, multilevel interventions. Attendees developed a shared understanding of the relevant science and created components of a 10-12 year roadmap as called for in the state’s Strategic Plan for Asthma. Polly is chairing a new primary prevention committee of the Massachusetts Asthma Advocacy Partnership, which is now working with the Department of Public Health to determine which of the symposium recommendations will be included in the next state strategic plan, currently in the planning stages. Existing evidence supports the importance of avoiding exposure to tobacco smoke and chemicals that are respiratory tract sensitizers or irritants. Living in close proximity to traffic independently increases risk of developing asthma. Chronic stress is also an independent risk factor for asthma and nearly doubles the risk of asthma onset associated with proximity to traffic-related air pollution. Given the state of the evidence, asthma leaders in Massachusetts are committed to ongoing discussion about opportunities for primary prevention, developing policies to reduce exposure to risk factors, and implementing pilot programs with rigorous evaluation to develop effective interventions. Some actions are achievable within the five-year timeframe of the next strategic plan; others will unfold over the longer term as research on effective interventions strengthens. Finding resources to support an implementation research agenda continues to be a pressing need. Since the Massachusetts symposium, leaders in other states have expressed interest in pursuing a similar strategy to reduce the burden of asthma over time. Our hope is that the primary prevention of asthma will become a more widely shared goal and ultimate reality. Massachusetts communities have high asthma rates, resulting in a substantial societal burden of human suffering, lost capacity and productivity, and direct fiscal costs. In 2010, 10.4% of adults in Massachusetts had asthma—one of the highest prevalence estimates in the nation. Current asthma prevalence among adults increased by 22.4% between 2000 and 2010. In 2009, 9.3% of Massachusetts children had current asthma . And Massachusetts is not alone: asthma rates are increasing in states across the US. As with other chronic diseases, far more resources focus on managing asthma in people who have it than on preventing the disease. Better compliance with medications, behavior modifications resulting from asthma education, and environmental interventions that reduce a person’s exposure to allergens and irritants are essential secondary prevention strategies that can reduce asthma attacks and keep people out of the doctor’s office, emergency room or hospital, often cost-effectively. Yet, there remains an urgent need to better understand the root causes of asthma and to develop strategies for reducing the rate of new cases. A growing body of research documents associations between asthma onset and a range of risk factors, many of which are modifiable, such as exposure to contaminants and allergens in indoor air ; lack of breast feeding ; maternal health (including stress associated with poverty and racism, as well as obesity, and other factors ; and outdoor air pollution . Evidence is also emerging that both adults and children living in close proximity to air pollution sources—for example traffic on busy roadways—are at higher risk than those living at greater distance . Even higher rates of asthma onset are observed among children exposed to traffic who also experience significant stress in their lives . Hundreds of specific chemicals have been associated with the onset of asthma in workers , and recent studies suggest that many of these same chemicals are found in household settings and may be associated with the onset of asthma in both children and adults . A small but growing body of research has examined the impacts on asthma onset of specific interventions to reduce modifiable risk factors such as exposure to dust mites and other indoor allergens  as well as vitamin D deficits . Several studies have demonstrated reduced rates of new onset asthma among recipients of an intervention to address multiple risk factors as compared to a control group . A review of these studies suggests that a more systemic, multifactorial approach may be effective . What could a state concerned about asthma prevalence do to reverse rates over time? For which risk factors is the weight of the evidence strong, indicating a known association between exposure and asthma onset? Where there remain uncertainties about the strength of the science, what other considerations might justify action to modify one or more risk factors? What kinds of interventions would align best with an understanding of asthma development as a complex, multifactorial process? A two-day symposium on April 23-24, 2013, at the Massachusetts Medical Society will pursue these questions and feed recommendations into the next statewide strategic plan for asthma, which is in the early planning stages. Polly Hoppin and Molly Jacobs of the Lowell Center for Sustainable Production at the University of Massachusetts, Lowell, are convening the symposium, pursuing a goal they and others helped install in the current state strategic plan: “to develop…. [with input from] a diverse group of professionals and individuals… a roadmap for better understanding the causes of asthma and the role of primary prevention in Massachusetts” . The Symposium planning committee includes representatives of the Massachusetts Asthma Advocacy Partnership, a statewide asthma coalition; the regional offices of the American Lung Association; the US Department of Health and Human Services and EPA; the state Department of Public Health; the Asthma Regional Council of New England; the Boston Public Health Commission; hospitals and universities. CHE Science Director Ted Schettler has been instrumental in helping shape the agenda and is giving the opening presentation. Ten years ago, research on the cost-effectiveness of home-based programs in reducing asthma symptoms was just emerging. New England organizations were leaders in synthesizing the research and convening public and private payers to discuss how to provide people with severe asthma home-based environmental interventions and asthma education to help bring their asthma under control. These activities played an important role in generating federal support for the delivery and financing of home visits for asthma. Organizers of the primary prevention symposium intend the April meeting to break comparably new ground in both the meeting processes used and its outcomes. A decade from now, we hope to be able to point to this gathering as an important first step in advancing understanding of the primary causes of asthma and action to address them. Massachusetts Behavioral Risk Factor Surveillance System, Massachusetts Department of Public Health, and US Behavioral Risk Factor Surveillance System, Centers for Disease Control and Prevention, multiple years. e.g., Mendell MJ. Indoor residential chemical emissions as risk factors for respiratory and allergic effects in children: a review. Indoor Air. 2007; 17(4):259-77; Jaakkola JJ, Knight TL. The role of exposure to phthalates from polyvinyl chloride products in the development of asthma and allergies: A Systematic Review and Meta-analysis. Environ Health Perspect 116(7):845-853; Chen YC, Tsai CH, Lee YL, et al. Early-life indoor environmental exposures increase the risk of childhood asthma. International Journal of Hygiene and Environmental Health. 2011;215:19-25. Kull I, Wickman M, Lilja G, et al. Breast feeding and allergic diseases in infants—a prospective birth cohort study. Archives of Disease in Childhood. 2002;87:478-481; Oddy WH, Hold PG, Sly PD, et al. Associations between breast feeding and asthma in 6 year old children: Findings of a prospective birth cohort study. British Medical Journal. 1999;319:815-819. Künzli N, Bridevaux P-O, Liu L-J S, et al. Traffic-related air pollution correlates with adult-onset asthma among never-smokers. Thorax. 2009;64:664-670; Jerrett M, Shankardass K, Berhane K, et al. Traffic-Related Air Pollution and Asthma Onset in Children: A Prospective Cohort Study with Individual Exposure Measurement. Environmental Health Perspectives. 2008;116:1433-1438; McConnell R, Islam T, Shankardass K, et al. Childhood incident asthma and traffic-related air pollution at home and school. Environmental Health Perspectives. 2010 Jul;118(7):1021-6; Clark NA, Demers PA, Karr CJ, et al. Effect of early life exposure to air pollution on development of childhood asthma. Environmental Health Perspectives. 2009;118(2):284-290; Shankardass K, McConnell R, Jerrett M, et al. Parental stress increases the effect of traffic-related air pollution on childhood asthma incidence. Proceedings of the National Academies of Science USA. 2009;106:12406-11. McConnell R, Islam T, Shankardass K, et al. Childhood incident asthma and traffic-related air pollution at home and school. Environmental Health Perspectives. 2010 Jul;118(7):1021-6. Shankardass K, McConnell R, Jerrett M, et al. Parental stress increases the effect of traffic-related air pollution on childhood asthma incidence. Proceedings of the National Academies of Science USA. 2009;106:12406-11. Malo J-L, Chan-Yeung M. Appendix: Agents Causing Occupational Asthma with Key References. In: Bernstein LI, Chan-Yeung M, Malo J-L, Bernstein DI (eds). Asthma in the Workplace. 3rd Ed. New York: Taylor & Francis, 2006. Mendell MJ. Indoor residential chemical emissions as risk factors for respiratory and allergic effects in children: a review. Indoor Air. 2007; 17(4):259-77. Maas T, Kaper J, Sheikh A, et al. Mono and multifaceted inhalant and/or food allergen reduction interventions for preventing asthma in children at high risk of developing asthma. Cochrane Database of Systematic Reviews. 2009; Jul 8;(3):CD006480. Litonjua AA. Vitamin D deficiency as a risk factor for childhood allergic disease and asthma. see Chan-Yeung M, Ferguson A, Watson W, et al. The Canadian Childhood Asthma Primary Prevention Study: Outcomes at 7 Years of Age. Journal of Allergy and Clinical Immunology. 2005 Jul;116(1):49-55. Strategic Plan for Asthma in Massachusetts, 2009-2014. Department of Public Health, Commonwealth of Massachusetts, 2009.